I'll be going to the Hollywood Cemetery again tonight to watch another movie under the stars and listen to some good music. Tonight is the last showing and I just had to take advantage of it, since there will be no more until next summer. I made some grilled veggie sandwiches, lentil soup and these very yummy cookies for my picnic dinner with my friends. These cookies reminded me of Reese's Peanut Butter Cups but in a cookie form. I'll be giving most of them away to all my friends and eating what is left for breakfast tomorrow with a tall glass of soy milk. 1. In a large mixing bowl, combine oil, sugar, maple syrup, non-dairy milk, and vanilla and mix until smooth. Sift in flour, cocoa powder, black cocoa powder if using, baking soda, and salt. Mix to form a moist dough. 2. Make the peanut butter filling : In another mixing bowl, use a hand mixer to beat together peanut butter, powdered sugar, 2 Tb of the soy creamer, and vanilla to form a moist but firm dough. If peanut butter is dry and crumbly, stir in the remaining Tb of non-dairy milk. If dough is too wet, knead in a little extra powdered sugar. 3. Preheat oven to 350 F. Line two baking sheets with parchment paper. 1. Create the centers of the cookies by rolling the peanut butter dough into 24 balls. Scoop a generous tablespoon of chocolate dough, flatten into a thin disc, and place a peanut butter ball in the center. Fold the sides of the chocolate dough up and around the peanut butter center and roll into a smooth ball between your palms. Place on a sheet of waxed paper and repeat with remaining dough. If desired, gently flatten cookies slightly, but this is not necessary. 2. Place the dough balls on lined baking sheets about 2 inches apart and bake for 10 minutes. Remove from the oven and let cookies stand for 5 minutes before moving them to wired racks to complete cooling. Store cookies in tightly covered container. If desired, warm cookies in a microwave for 10 to 12 seconds before serving. i love cookies...thamks sweety for this post. I've tried to make my own version of these before and they didnt come out nearly as peanut buttery as they should have-Ill have to give this a go! 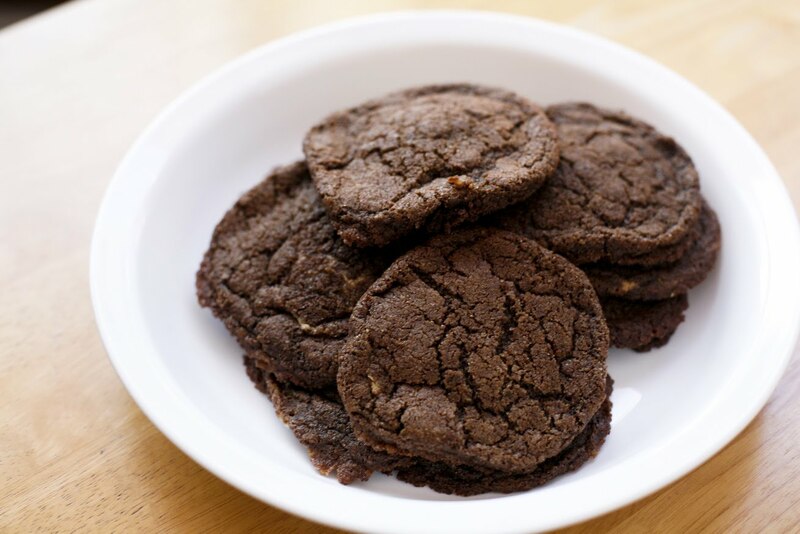 these are from "vegan cookies invade your cookie jar." Nichole - Yeah I know. I finally got the book. Too many good recipes to try! Peanut butter, chocolate and vegan. Never thought it would work. The look says it all. I don't care how flat they are, these cookies look scrumptious! Ooh Jacklyn, do these have peanut butter inside of them? Like in a layer? If so, super nice! If not, still nice (smile). Stella - Yes, they have a layer of peanut butter inside but when i broke it in half to take a pic of the inside, the layer was too thin and not really visible. But still nice to know its there. I don't have pure maple syrup. Can I use agave syrup instead? Or just the imitation maple syrup?